Earlier this month, the Milbank Memorial Fund published a report on State Policy Capacity and Leadership for Health Reform, which looked at the leadership, governance, staff capacity, and resources required for state governments to plan for and implement new health policies. The authors developed a capacity checklist, outlining what’s needed for policymakers as they embark on new health reform initiatives. Now, in a new issue brief, one of the authors of that report, W. David Helms, looks at a specific opportunity to apply those capacities—namely, the experience of state health policy leaders who were directly involved in creating the state-based insurance exchanges launched in 2013. 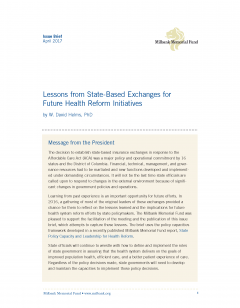 The paper identifies what the directors believe to be the critical success factors for implementing these exchanges as well as any major state-based health policy implementation activity. These factors include leadership and governance, management of scope, and experience and expertise of core staff. How leaders make decisions and implement new health polices is especially timely given the continuing debate about changes to the Affordable Care Act and improving health care delivery in the United States. It goes without saying that past experiences provide important lessons for future efforts.